The cherry trees have passed full bloom and shed their flowers, and the Kitaageo area is ushering in a season of fresh springtime greenery, pleasant breezes and refreshing weather. This spring we mark the fourth anniversary of our clinic's opening, and on this occasion we have decided to revise our days and times of operation and update the range of medical fields in which we offer services. Moreover, we have made new additions to the clinic itself, including a pediatric examination and treatment room, a kids' waiting area and play space, and changing rooms for users undergoing medical checkups and examinations. Utilizing my wide-ranging experience in emergency medical care and other fields, I am proactively expanding our medical services into the areas of pediatric and skin diseases and disorders in addition to the internal medicine services we already offer. We have added changing rooms for medical checkup/examination users, yearly regular medical checkup services, computed topography (CT) scans, endoscopies (gastroscopies and colonoscopies) and other secondary examinations, and additional improvements to facilitate more comfortable medical examinations and care. Furthermore, we are now open on Saturdays and Sundays; although our clinic is closed on Fridays, we are open from the weekend all the way through to the latter half of the following week. Thanks to these convenient weekend hours, you can rest easy knowing that medical checkups and care are available before the next week to rolls around, rather than only on weekdays. We strive to be a warm and welcoming medical clinic offering a high degree of patient freedom. I will continue to pursue improvements in order to serve as your trusted, local family doctor. It's my pleasure to help you! ■We offer wide-reaching primary care services encompassing high blood pressure, diabetes, hyperlipidemia and other common internal medicine field disorders/diseases as well as allergic diseases. ■Endoscopic procedures can be used to examine and make relevant diagnoses for the esophagus, stomach, duodenum and large intestine. ■With the exception of severe cases, we provide treatment for external injuries (small cuts on the hand, pus formation in wounds, etc.). ■Our computed topography (CT) equipment enables scans anywhere from the head to the pelvis. 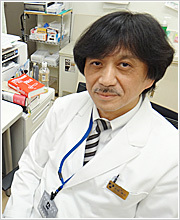 ■Breath tests can be used to detect Helicobacter pylori (H. pylori) infections. ■We offer placenta injections, vitamin B complex injections, treatment for male-pattern hair loss, and other such treatments paid for in full by the patient (not covered by insurance). Feel free to ask as for further details anytime. ■We also provide influenza (flu) vaccinations as well as optional vaccinations (recommended prior to overseas travel) including those for typhoid fever, rabies, tetanus, hepatitis A and B, etc. ■Standard x-ray examinations of the chest, abdominal, etc. The above examinations/tests as well as others not listed here are available at Kitaageo Clinic. Based on long-term experience working at major regional emergency care hospitals as well as experience examining and treating a diverse array of patients in various fields, Dr. Nakano is able to offer initial diagnoses as well as primary care services to Kitaageo Clinic patients. Copyright © 2017 Kitaageo Clinic. All rights reserved.